Despite the strike-shortened schedule, it has been a long season for the Detroit Red Wings. After losing Captain Nicklas Lidstrom and offensive anchor Tomas Holmstrom to retirement during the off-season, the already-spotty Wings roster has been plagued by injuries throughout the 48-game run. The Red Wings slid into the seventh spot last night with a 5-2 win over Nashville. The Red Wings stand at 54 points with only a Saturday night contest with Dallas left on their schedule. There are three teams left jostling for two playoff spots: the Wings, the Minnesota Wild and the Columbus Blue Jackets. Minnesota is in eighth with 53 points, and Columbus is in ninth with 52. Columbus also has only one game left, and the Red Wings can clinch a playoff berth by scoring a single point in their game with Dallas. However, to retain the seventh seed, the Red Wings must win their final game and see Minnesota drop one of the games in its final back-to-back. Minnesota plays Edmonton at home on Friday and at Colorado on Saturday. Red Wings fans know what’s at stake. 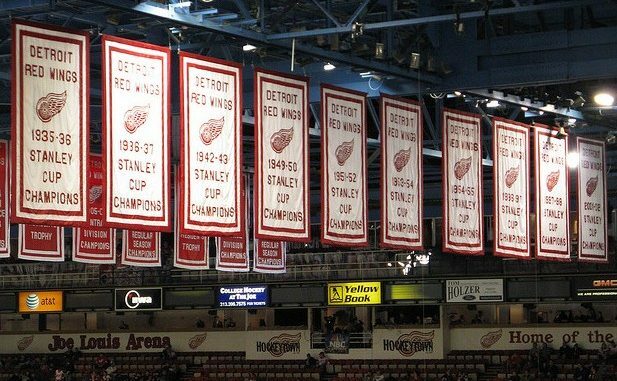 The Red Wings have not missed the playoffs since 1990, a 21-season streak. The vast majority of Albion College’s students were not yet alive the last time the Red Wings did not make the playoffs, including most seniors. The road the playoffs has been extremely tough. The Red Wings’ Central Division is one of the toughest divisions in the NHL, with every team except Nashville boasting a winning record against non-division foes. The gauntlet included four games against the archrival Chicago Blackhawks, who have already clinched the President’s Cup as the team with the best regular season record. The Blackhawks swept the season series. The grueling schedule has only been made tougher by a lack of team consistency throughout the season. To guarantee a playoff spot, the Red Wings would have to end the season with a four-game winning streak, their first such streak of the season. The Red Wings futility has come from a combination of spotty offense and inexperienced defense. Detroit holds on to a +1 goal differential, beating only Minnesota and Columbus among teams still in the playoff hunt. The Wings have also been plagued by injuries all season, most notably to Todd Bertuzzi and Daren Helm. Bertuzzi injured his back six games into the season, and Helm did the same after just one. Both Bertuzzi and Helm provide energy and speed to the Red Wings, and their loss has been more a loss of ice presence (and hits) than a loss of scoring. The Red Wings were also affected by an early injury to backup goalie Jonas Gustavsson, as well as a season-long upper body injury to Mikael Samuelsson. Luckily for the Red Wings, Bertuzzi will likely be back for the final game of the season, which could provide the spark the Wings need to seal the playoff spot. Samuelsson has also been cleared to play, but is questionable unless the Wings make the playoffs. The scenarios are clear. Win the final game and we’re in, lose and we have to depend on a Columbus loss against Nashville to steal the eighth seed. Win on Saturday, and sports’ ultimate playoff streak remains alive at least one more year. Photo courtesy of Jim B L, via Flickr. Licensed under Creative Commons.